About a year ago there was such a dramatic unveiling of cutting edge technology and jobs creation that the Governor of Indiana and the President of the United States were tripping over themselves to get here to claim credit - or at least that's what this blogger thought. 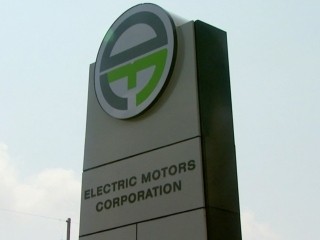 Electric Motors Corporation bought a former RV dealership (which had fallen victim to the economic slowdown) and officials were certain that a vast new Industry (jobs machine) was going to take up the slack caused by the slumping RV and modular housing industry in Elkhart County. They seemed a shoe-in for stimulus money, and when President Obama scheduled a return to our area it seemed like a done deal. To many people's surprise the President visited a nearby facility instead - a recently acquired Monaco Coach facility. Our Congressman, Joe Donnelly, commented at the time that it was probably just too soon to expect the expected announcement of cash infusion. Things seemed to be chugging along. In early September 2009 EMC unveiled a prototype of an all-electric pickup truck dubbed "Flash". As was typical in this time period the reporter got a bit ahead of events. Electric Motors has already revitalized Wakarusa, bringing hundreds of jobs to the area, and promising more. A big step for a town hit hard by the auto industry's struggles. It should be remembered that no one was building anything yet. Still, signs were good. Then in early November came this story: Layoffs have some concerned that Electric Motors Corporation moving in wrong direction Oddly, this was not nearly the news event of the original announcement. WAKARUSA — It's been 6 months since Wakarusa based Electric Motors Corporation announced plans to turn Elkhart County into an electric vehicle manufacturing center, creating up to 1,600 new jobs along the way. But, now, some in the community are concerned that those plans may be running "off the road." But it's the next sentence that exposes "the man behind the curtain"
EMC laid off at least 4 employees this week--about 1/3 of its total workforce. In other worlds, this company had about a dozen people on the payroll. This company which hung out the potential of 1600 jobs. But Wilhelm Cashen, President of EMC said this was just a minor adjustment. "Our partners purchased a building here in Wakarusa, and that's going to be where we put our training center, our educational center. That will also serve as a training center for the area," Cashen said. The building, he said, is a former Monaco Coach plant near the corner of State Road 19 and County Road 40. I passed that building recently, noticed the "For Sale" in front of it. That's what inspired my investigation and this post. More on that later. The last comment on the online version of this really excellent article seems pretty telling to me. Well, i guess Wil Cashen feels that it's alright to lie to the press. Not only did the whole marketing department lose their positions but, many other people lost their jobs. My sources tell me that only two employees (not board members) are left at EMC. And the fact that Livernois Automotive is not worried about not being paid by EMC is a totally weird situation. If I was a supplier for a company, I would be really upset if the company I was supplying didn't pay me. As for others who have done work for EMC, I know for a fact that their finances are in deep trouble because they missed two pay periods and owe many of their employees hundreds if not thousands of dollars (another Wil Cashen LIE). I also know of contract workers who did work in August and September and, as of today (11/9) they still have yet to be paid even though they have contracts and/or work agreements. Mark my words, this company will not make it. How can you expect to have a good relationship with people who want your product if they do not have a working relationship with the people who make their product into a reality? In February of 2010, the Board must have decided to rearrange the deck chairs - and named a new President. It should be noted that this was a company press release; still, the new guy has serious credentials. WAKARUSA — An electric vehicle company that has promised to create jobs in Elkhart County, has moved its offices to Plymouth. Electric Motors Corp. said it moved to Plymouth and hired Roger Umbaugh, who is a retired certified public accountant, as chief financial officer. Umbaugh retired from H.J. Umbaugh & Associates, which is headquartered in Plymouth. Another minor shift in the game plan, I'm sure. I tend to follow local stuff, though I miss some. I'm really surprised to have heard so little of this tale of promise and failure. It even took a little bit of digging to put together a useful narrative to share. The promise was trumpeted to the heavens. The betrayal - not so much. Hi Donvila, please call me if you like an up date and not media hype, of what did go on at EMC and is going on now with EMC. Please call when you have a minute.